"Untruth spoken repeatedly appears to be truth". In a small village, there lived a Brahmin, by the name of Mitra Sharma. He was a worshipper of Fire-God. One day, during monsoons, when the sky was overcast with cloud, he decided to conduct a certain sacrificial ritual. 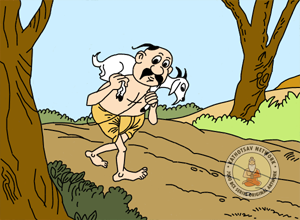 The Brahmin travelled to a nearby village, to visit a devotee, to request for a goat that he will offer it as a sacrifice to the Gods. On his arrival, he requested the devotee, "Son, I want to perform a sacrificial ritual on this auspicious time. Please offer me with a well-fed goat." The devotee agreed and offered him with one of his best goats. The Brahmin started his journey homewards. He carried the goat on his shoulders, so that he did not have problems in controlling the animal on the way home. On his way home, three crooks watched him from a distance. They were almost starving, and the Brahmin had a goat and he was all alone. 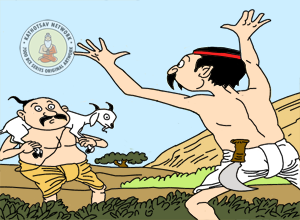 They discussed, "We will be saved from the fangs of hunger in this cold monsoon, if we can lay our hands on this goat that the Brahmin is carrying." They decided to trick the Brahmin, in order to gain the goat for themselves. 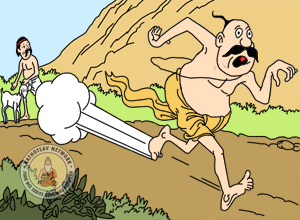 As planned, the first of the crooks stood in the Brahmin's path, by taking a shorter road. When the Brahmin, with the goat on his shoulders, approached him, he queried, "Ho Brahmin, Why is it that you behave so ridiculously?" "Why on earth are you carrying a profane dog on your shoulders?" On hearing this, the Brahmin got angry, he replied, "How can you not see any difference between a goat and a dog? Are you blind? Can't you see I am carrying a sacrificial goat?" The crook had played his part, and replied, "Please don't get angry on me. You may have it anyway you want. Please carry on with your journey". 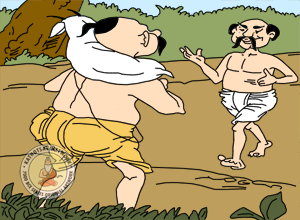 A little further, he was approached by the second crook, who said, "Ho Brahmin, shame on you! How can you carry this dead calf on your shoulders like that? Shame on you!" 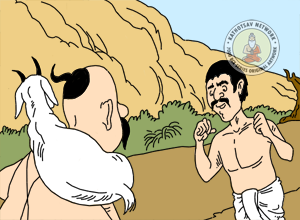 The Brahmin got even angrier, "Are you blind? Can't you see it is a goat and not a dead calf?" To this the second crook replied, "Have it anyway you want it to be, please don't get angry on me." When the Brahmin had gone a little further, the third crook accosted him, "Ho Brahmin. This is highly improper for you do something like this. Why do you carry a donkey on your shoulders? Put him down, before anyone sees you doing this!" Now, the Brahmin started thinking how can three different persons not see that was carrying a goat? He thought that he must be carrying a goblin, which is changing shape all the while. Fearing so, he put the goat down on the ground and ran home terrified. The crooks had succeeded in their plan. The crooks caught the goat at once, and feasted on the goat to their heart's content. Untruth spoken repeatedly appears to be truth.